Author archadeckofcolumbusPosted on February 12, 2014 Categories Archadeck of Columbus, Awards and community recognition, Hardscapes, The Archadeck differenceTags Archadeck awards, Archadeck customer satsifaction award, Archadeck national design award, Archadeck of Columbus awards, Archadeck of Columbus wins customer service award again in 2014, Archadeck outdoor living, Dublin OH combination outdoor living spaces, Dublin OH deck and open porch combinations, Dublin OH hardscapes and patios, Dublin OH TimberTech Earthwood Evolutions Terrain deck builder, How to market to people not like you book by Kelly McDonald, Kelly McDonald author and marketing speaker, TimberTech Terrain decking, Unilock Brussels pavers, Unilock pavers in CopthorneLeave a comment on Archadeck of Columbus leaves annual meeting with three esteemed awards, knowledge and plently of memories! 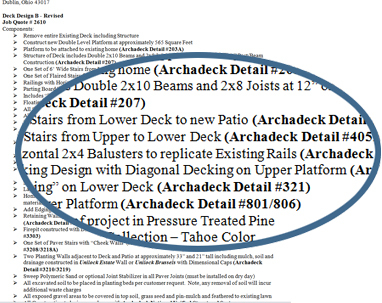 Archadeck of Columbus wins the Angie’s List Super Service Award for the 8th Time! 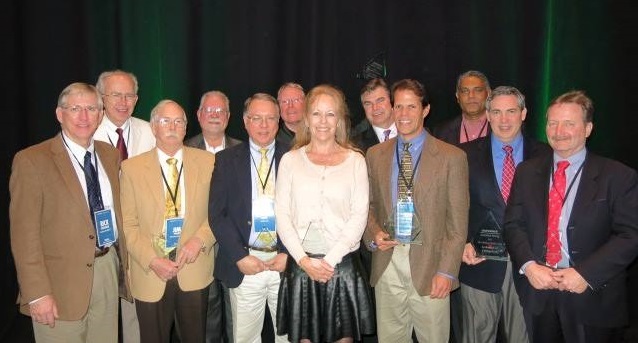 Archadeck of Columbus is humbled and proud to have been awarded the Angie’s List Super Service Award for 2013, and the 2013 Consumers Choice Award in Columbus for deck and patio builder! 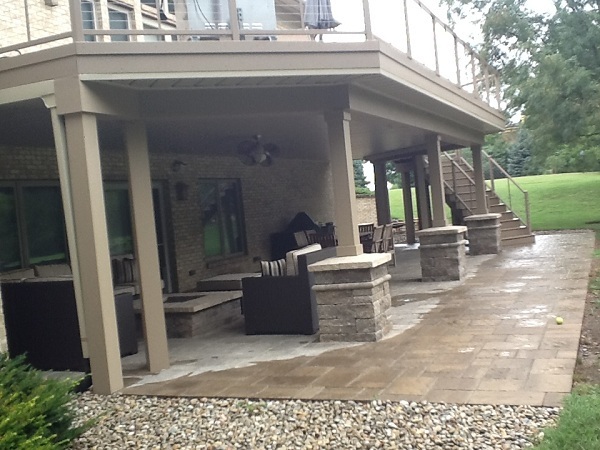 This covered paver patio in Columbus is a great example of expert design, planning and construction of an outdoor space. 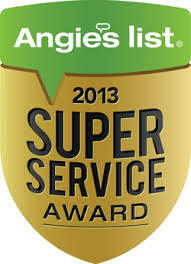 Archadeck of Columbus is humbled and proud to have been awarded the Angie’s List Super Service Award for 2013. This award is our 8th year in consecutive awards from Angie’s List. In addition to the Super Service Award we were also chosen as the winner for the 2013 Consumers Choice Award for deck and patios in Columbus for the second consecutive year! Nothing makes us more proud than to win an award that is based solely on the opinion of homeowners right here in the Columbus market. Each of these esteemed awards is a direct reflection of the relationships we forge with our customers and the quality of work we strive to achieve. We have been in business for over 11 years. 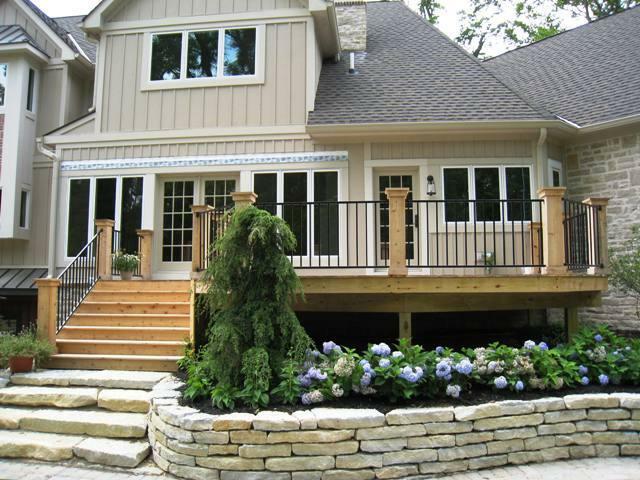 Along the way we’ve had the opportunity to work with Columbus homeowners on projects from decks to porches, patios, pergolas and many other outdoor living structures. We are committed to delivering exceptional service. All these factors go into the pride that we feel in receipt of this award because it is based on the opinion we value the most – that of our customers. Archadeck of Columbus wins the Angie’s List Super Service Award for the 8th consecutive year! The Angie’s List Super Service Award honors excellence among service providers who maintain superior service ratings and reviews on Angie’s List throughout the past year. Certain criteria must be met in order to be considered for this award. This criteria includes receiving a minimum number of unsolicited reports from those members. The selected companies must also maintain an “A” average on these reports and not be in poor standing with the Better Business Bureau. Less than 5% of the companies on Angie’s List receive the Super Service Award, so we are honored that our customers have elected us for an eighth consecutive year. 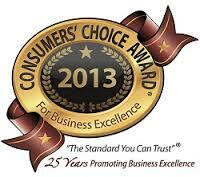 Archadeck of Columbus was also named the 2013 Consumers Choice Award winner for a second, consecutive year! Being considered for the Consumer’s Choice Award is a rigorous process as well. A company must first be nominated by at least two different Columbus area homeowners. Only the most nominated companies in each category will populate the final ballots. Voting is commissioned to Survey Sampling International® (SSI), a global leader in consumer research. The consumers chosen to vote in the survey are part of a registered panel population in your community. This consists of approximately 5,000 people who take the SSI survey to vote for the favorite businesses in each community. The final results are then tallied by an ethical review process done by a regulatory law firm that specializes in regulatory assessments – (Macmurray Petersen & Shuster). The ethical review team reviews the business before they decide upon the recipient of the award. Nominations can be submitted by anyone and the award winners are announced throughout the year. Winners are announced each year in December. The manner in choosing the winner for this award is much like the stringent practices seen in movie and music award shows. 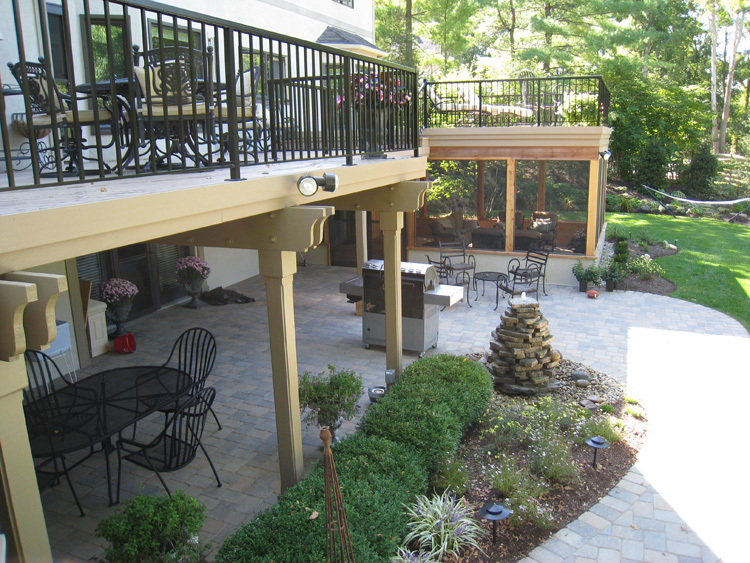 You can view photos of our completed outdoor structures by visiting our deck galleries and our patio and hardscape galleries located on our website. 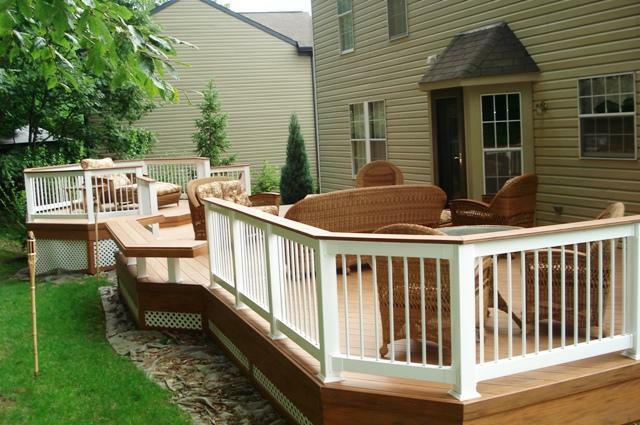 If you are among the many who count themselves as a satisfied customer of Archadeck of Columbus, visit Angie’s List or the Consumer’s Choice website to tell them about your experience! Author archadeckofcolumbusPosted on January 8, 2014 Categories Archadeck of Columbus, Awards and community recognition, The Archadeck difference, The importance of customer feedbackTags Angie's List Super Service Award, Angies List, Archadeck of Columbus, Archadeck of Columbus Angie's List Super Service Award winner, Archadeck of Columbus awards and recognition, Archadeck of Columbus wins Consumer's Choice award in Columbus, Choosing the Consumer's Choice award winner for Columbus, Columbus Consumer' Choice award for deck and patio builder, Columbus Consumer's Choice award for business excellence, Columbus deck builder, Columbus decks, Columbus Patio builder, Columbus porch builder, Consumer's Choice award, outdoor living, the Better Business BureauLeave a comment on Archadeck of Columbus wins the Angie’s List Super Service Award for the 8th Time! Archadeck of Columbus discusses the importance of customer feedback in improving and growing our performance. Customer feedback is important to us. Leaving you with a positive experience and a quality structure is our goal. Customer feedback is an important part of achieving continuous improvement of our business. Many businesses like to “say” they listen to the customer, but in truth sometimes they aren’t really listening. Archadeck of Columbus is different. We have been in business for a number of years and we regard the feedback that comes from our customers as a top priority. We are a fixture in the community and the same people we are providing outdoor living spaces for are the same people we live alongside, whose children play with our children, our neighbors. Our strong work ethic and professionalism stems from working in the hospitality industry where it is extremely important to get feedback, including negative as well as positive. We believe that in order to improve, we need to find out where to improve and this is why we provide two opportunities for our customers to provide feedback. Our 1st feedback form is an internal comment card which is focused on the production side of your experience with us. It is a grading mechanism for our installers. We leave this with our customers with a self-addressed stamped envelope for convenience return. We receive about an 80% response from these comment cards. It is important for us to hear your point of view on your individual experience with us so that we can find out what we did right or wrong. We use the information to improve and share the results with our installers to let them know what we are hearing from our customers. Some people are reluctant to share negative feedback but this is what the comment card is intended for. We want to know how well we did, or didn’t perform. We want to hear the good, the bad and the ugly. 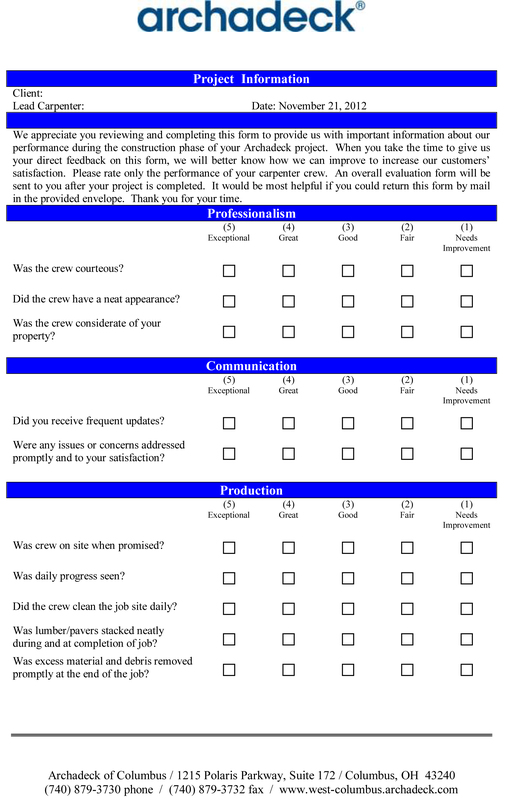 In addition to the internal comment card we also email customers upon completion of a project. These are things I share with the homeowner when we meet for our initial consultation and express the importance of providing all types of feedback. For us, the details are the most important. A good example of this is how important daily clean-up of the work site is to most homeowners. This is a detail that might be overlooked without the feedback of the homeowner. Archadeck of Columbus prides itself in getting very positive responses on details such as the installation process, and every day clean-up practices, etc. I share with everyone the fact that nobody is perfect and the way in which we continuously take measures to grade ourselves. There is no better feedback than that which is provided directly from the customer. 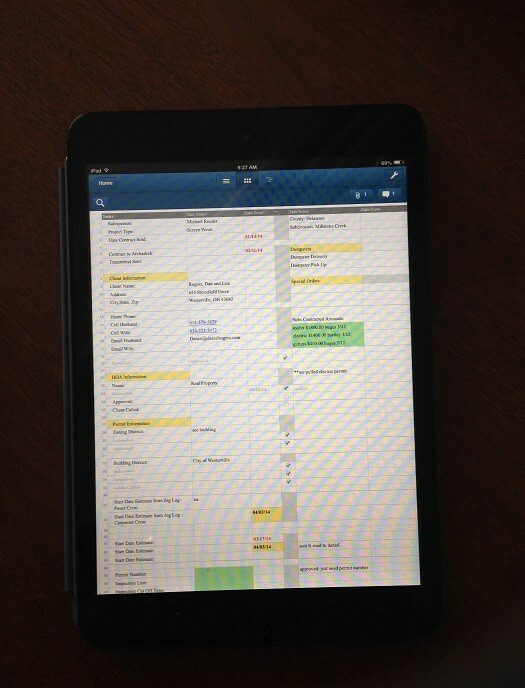 This type of communication is what our customer feedback provides. A business model is only as strong as the opinion it holds from its customers. We use the information we gather from each customer to improve all areas of our business. This allows us to facilitate improvements. 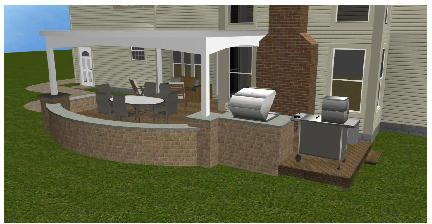 Can any old contractor build a deck? Well… It depends on your definition of a deck. There are good decks and bad decks, ugly decks and pretty decks, strong decks and not-so-strong decks. In reality there are hundreds of different levels of quality and many factors that determine the quality level you will receive. When you meet a prospective contractor for the first time, you will notice what they’re wearing, their age, their demeanor and possibly even if they have the well worn hands of a seasoned contractor. You will listen to what they say and look at pictures of their work. All of these are important in selecting a contractor. But are they enough? No. We’ve all heard the phrase “the proof is in the pudding” meaning we will find out if their work matches what they promise when the work is done and it’s too late to go back. At Archadeck, our proof is in every step that happens along the way. 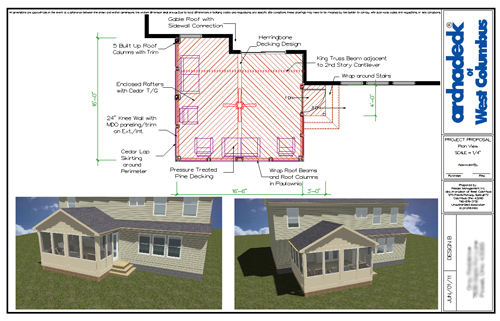 Before we ever start a project, we provide completely detailed specifications of how every element of your project will be built. What you’re seeing in the illustration to the right are excerpts from just one page of our Unified Structural System. 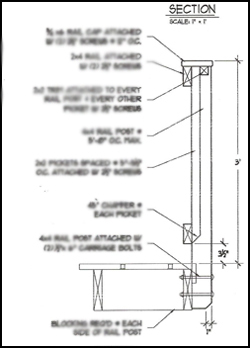 This entire page dictates how every element of one railing section will be built. We guarantee it. Every nail placement, the picket spacing, and all the technical details are documented and followed in our construction process. 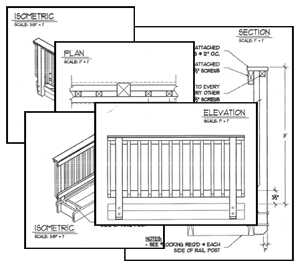 Our instructions include drawings of every element from the top, bottom, and sides to make sure your project is built to our technical standards and specifications. And, our “secret sauce” is not a secret. 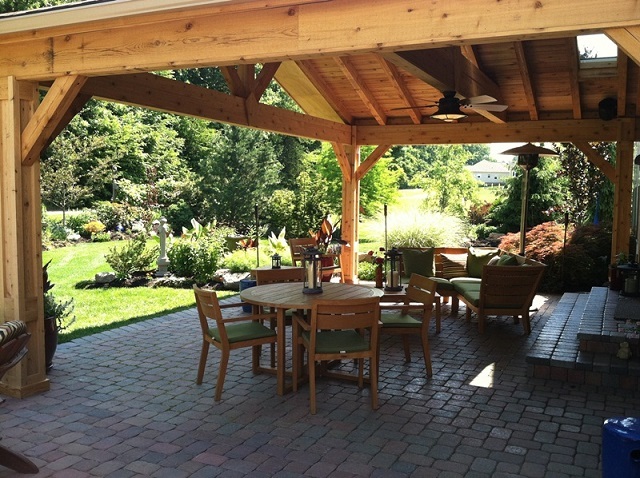 We detail every component of your project whether it be a deck, screen porch, sunroom, pergola, patio or other project. 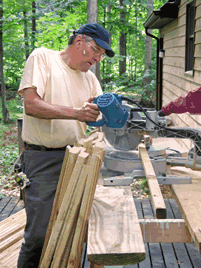 We specify it in writing to you, in the permit and to our carpenters. See an example here. The call-out detail shown in the oval shows the detail to which we specify what we are building for you. Finally, we have the ability to provide a 3-D rendering of what their project is going to look like. 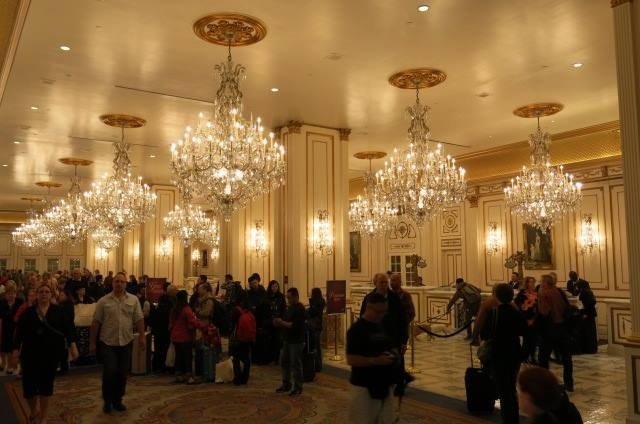 We know how difficult it is to envision what the project will look like no matter how detailed the description is. We want our customers to be happy at every single step along the way from our initial meeting to our final walk-through. Our best sales people are our past customers and we think that’s the way it should be. If you’re thinking about a project, give us a call. Our consultation is completely free. We look forward to walking through ideas and suggestions with you To learn more about us, visit our Archadeck of Columbus website. We look forward to talking to you. Give us a ring at (740) 879 – 3730 or email us at westcolumbus@archadeck.net. Author archadeckofcolumbusPosted on January 25, 2012 Categories Archadeck of Columbus, The Archadeck differenceLeave a comment on Can any old contractor build a deck?